The ultimate mobile computing/learning experience? This looks like an interesting development from Swedish company Cloudo http://www.cloudo.com/. They Say “Imagine a world where your computer wasn’t tied to a physical computer, but rather a computer that lived on the Internet, instantly accessible from any computer or mobile phone connected to the Internet, no matter where you are or what you are up to. Cloudo offers just this.” It is still in the development phase but I wonder what potential it has to be used in Scottish schools in conjunction with Glow ? I wanted to alert interested parties to a Sport and PE conference hosted by the Scottish Schoolsport Federation and the Scottish Local Authority Network Of Physical Education. The conference will be held at the Ratho Adventure Centre on the 22nd of May 2008 more details will be published on the SSF website http://www.scottishschoolsportfederation.org/ in due course. 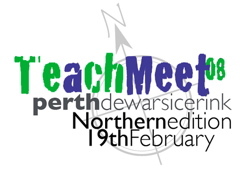 I am gutted that circumstances have conspired against me and I can no longer attend Teachmeet Perth tonight. However I am still going to attempt to be there through the Flashmeeting that has been set up. I have never used Flashmeeting so this will be a new experience. I hope it all works out as previous teachmeet events have been brilliant and you always pick up some great stuff. Good luck to Neil and everyone else who has helped organise the event and to everyone who is selected to present. 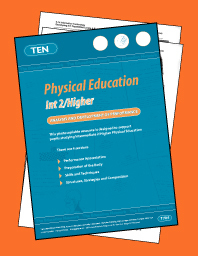 The Education Network http://www.ed-net.org.uk/ run by Aberdeen University has a range of support materials including Higher and Int2 PE resources for pupils and staff. This includes a photocopiable booklets a selection of candidate questions and sample scripts, PowerPoint slideshows, Interactive Whiteboard files, include activities such as ‘finding missing items’; ‘matching’; ‘determining sequence and structure’ and ‘on-field tactics’. 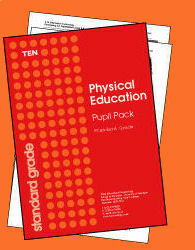 There is also a resource for Standard Grade PE It contains explanations, guidance and examples on the following elements of the course. The packs cost about £100. If like me you like your resources free then have a look at our Higher wiki and our Standard Grade Wiki you can help yourself to the resources as long as you make reference to their origin. If you do use some of our resources how about repaying the compliment and giving us access to some of your resources. Who knows we could start a PE swap shop! The Duke of Edinburgh’s Award is hosting two conferences during March 2008, one in Edinburgh and one in Nairn, on the theme of the Award’s role in modern Scottish education. The events are aimed at directors of education, heads of schools services, teachers, award leaders and volunteers within schools. The aims of the conferences include discussing how the Award contributes to the achievement of Curriculum for Excellence and sharing information about the Award’s Curriculum for Excellence Pilot Project and Award Leader Training Programme. The conferences will include presentations from Award participants, members of the Duke of Edinburgh’s Award’s national development team, employers and representatives from key bodies in Scottish education. Places at the Edinburgh conference are going fast but there are still plenty of spaces for the Nairn Conference. There are 2 new videos to check out on teachers TV focusing on dance within PE and specifically aimed at encouraging boys to dance. http://www.teachers.tv/video/24551 Male student teachers talk about overcoming the stigma of being a dancer, discuss the balance that dance gives to the curriculum and explore the benefits of men teaching dance. http://www.teachers.tv/video/24556 Ricardo Green, a newly qualified PE teacher at Cumberland Specialist Sports College, attempts to introduce dance to his reluctant Year 9 boys. Just came across this blog http://freetech4teachers.blogspot.com/ loads of links to free resources and applications for teachers of all subjects. Have a look you may find something of interest.